The Desktop Datalux SpaceSaver with embedded Cirque Easy Cat Touchpad provides a compact keyboard and mousing input solution. The keys are half the normal depth (i.e. same width (side to side) but shorter depth (top to bottom) - making it easier to reach upper rows for individuals with limited range of movement. The upper portion of the keyboard is positively inclined to reduce the reach for the keys and touchpad. Available in White (Beige) or Charcoal. 1 year manufacturer direct warranty. 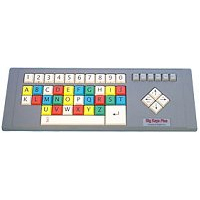 This keyboard features easy to target 1" x 1" keys, and has a simpler layout with less keys for individuals who may find a normal layout confusing. All BigKeys keyboards are hard-wired to be switchable between ABC and QWERTY layouts, and you can rearrange the keycaps to match custom layouts you may have created in your operating system or software. Available accessories include protective skinguards (to prevent against damage from spills, etc.) and rigid plastic keyguards are available for individuals needing further targeting assistance. All keyboards have a grey housing, but color options on the keys are as follows: Black Legends on White Keys, White Legends on Black Keys, or White Legends on Colored Keys. Made from Ultraflex, the Keyboard Skin is an ultrasoft polymer skin that fits snugly over the BigKeys keys. 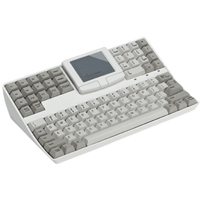 The Flat Datalux SpaceSaver provides a compact keyboard input solution. The entire keyboard is low profile, making it ideal for portability and storage. The keys are half the normal depth (i.e. same width (side to side) but shorter depth (top to bottom) - making it easier to reach upper rows for individuals with limited range of movement. In addition, the keys are negatively inclined in the keyboard, to prevent wrist extension. Available in White (Beige) or Charcoal. Warranty: 1 year manufacturer direct. LittleFingers - the world's first keyboard designed especially for children. 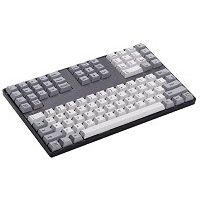 Smaller keys and an integrated trackball provide a very small footprint, making this keyboard ideal for younger computer users. 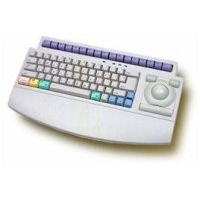 Comes in PS/2-ADB switchable, USB for PC or USB for Mac interface and with a Trackball (TB) or Numeric Keypad (NK) on the right side of the keyboard. NOTE: This item has been out of production for 3 years and there is no ETA when it will be available again. We have 1 Mac USB with Numeric Keypad unit left in stock. Please contact us for alternative product suggestions.